We were appointed as landscape architects by a developer client for this proposed 400 unit, 11ha low density residential development, located at the edge of the Green Belt. We were initially tasked with the preparation of a landscape design to the satisfaction of the design team and client. 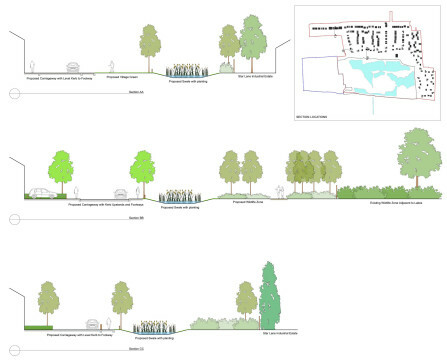 Following on from this exercise we prepared landscape architect ‘s information for an Outline Planning submission. 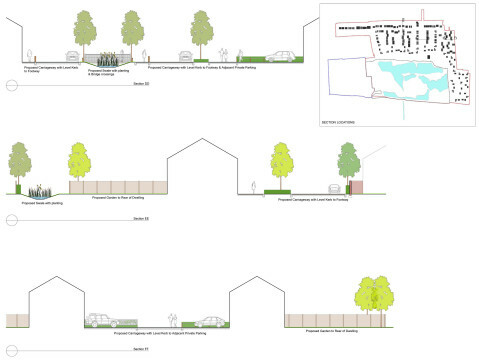 The landscape design for majority of the residential public realm within this site adopts the principals of Home Zone, with carriageway and footway being on the same level. Our landscape architects encourage the adoption of this design principal to encourage slower vehicular speeds and to give the pedestrian priority. The benefit of this design tool can be slower vehicular traffic speeds, more space being given over to the pedestrian, with safe doorstep play becomes a real possibility within the built environment. The overarching drainage strategy for this site adopt the principals of Sustainable Urban Drainage Systems (SUDS). In this case the surface water from the carriageways and footways have been designed to drain into swales at the edges of strategic roads. This surface water can be drained into the swales at surface level and sub base level. As well as functioning as a sustainable drainage solution our landscape architect’s proposal use these swales to provide a valuable ecological resource for our native flora and fauna. This is achieve by the specification of plant material which is of native provenance. Our landscape architects suggested a buffer zone between the proposed residential development and the existing wildlife zone, surrounding the lakes to the south. The landscape design for this buffer zone was to be in the form of an ecological park. It would enable residents within the vicinity of this park to have an accessible public open space and possibilities to enjoy wildlife close up.